How and Where to Buy Dulera Online? Buy Dulera online through Canadian Pharmacy World at an amazing price. Our Canadian Pharmacy offers RX and OTC medications online and over the phone from suppliers in Canada as well as other countries around the world. For more information about our pharmacy, check out About Us. Are there Alternative Names for the Brand and Generic Dulera? The brand Dulera also called Zenhale comes from Canada and is manufactured by Merck. It is available in the quantity of one inhaler only. There is no generic available for this medication. What Dosages and Forms is Dulera available in? Dulera is available in the strength of 100mcg/5mcg/120 dose and 200mcg/5mcg/120 dose inhalers. What is Dulera used for? 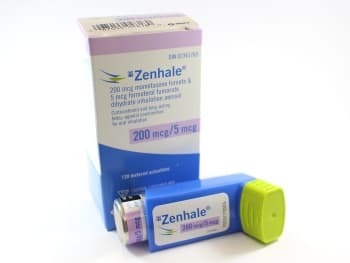 Dulera inhaler (Formoterol/Mometasone) is a prescription inhaler that is used to control and prevent asthma symptoms such as wheezing in people older than 12 years. This inhaler has two medications Mometasone and Formoterol. Mometasone belongs to a class of drugs known as corticosteroids. It works by reducing the irritation and swelling of the airways. Formoterol belongs to the class of drugs known as long-acting beta agonists. This medication works by opening airways in the lungs to make breathing easier. Dulera inhaler must be used regularly to be effective. What are the Possible Side Effects of Dulera? Are there any Precautions or Drug Interactions for Dulera? You should not use Dulera if you are allergic to Formoterol or Mometasone. Before you start taking the medication, talk to your doctor about your medical history and about all the medications you take including OTC and herbal medications. It is unknown whether Dulera will harm an unborn baby. Inform your doctor if you are pregnant or plan to become pregnant while using this medication. It is unknown whether Formoterol and Mometasone canpass into breast milk or if it could harm a nursing baby. Dulera should not be given to a child who is younger than 12 years old. Dulera is not a rescue inhaler and should not be used as a treatment for sudden asthma symptoms. Dulera should be stored at room temperature away from heat and moisture.